Gardone is used to be the classy resort of the Belle Époque. Even today it is counted among the most elegant resorts on the Lake. Gardone is well-known for its mild and constant climate. Already at the beginning of the century a huge botanical garden, which is worth visiting, was created. But also the gardens in and around the small town are splendid. Surrounded by palm trees, magnolia, cedars, the fragrance of jasmine blossoms in the air. You can walk in the shade of old cypresses, and immediately feel taken back in time. Not without reason Gardone is internationally known as “the city of gardens”. 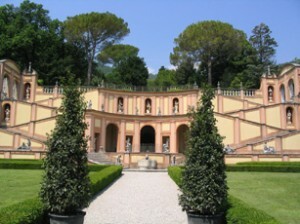 Just outside the town is the Vittoriale estate, which was created by the poet Gabriele d’Annunzio. The hilly hinterland is ideal for horse riding and hiking. Eight towns make up the community. 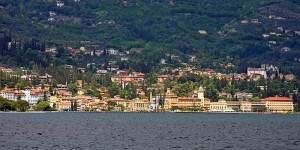 Fasano (bordering with Toscolano Maderno) and Gardone Sotto are on the lake. Gardone Sopra, Montecucco, Supiane, Morgnaga and Tresnico sit on the hill. San Michele, which sits above the rest, is found at the entrance of Val di Sur. Mounts Lavino (907 m), Forametto (1240 m) and Spino (1488 m) dominate the area, which lies on the shore between the mouths of the Bornico River to the east and Barbarano River to the west. The uncultivated, wood-covered hinterland near Valsabbia has many walking paths and trails. There is a huge variety of exotic vegetation: cedars, magnolias, camphor trees, palm trees, etc. make Gardone an internationally famous “garden city”. Villas and hotels surrounded by large parks on the shore have preserved their original 19th century Liberty style. The villa was designed by German architect Schaefer at the beginning of the 20th century to resemble the monuments of the Acropolis in Athens. The neoclassical villa owned by the Langensiepen family has a grand façade with columns, a loggia supported by caryatids, a pediment decorated with bas-relief, and an ornate stairway. 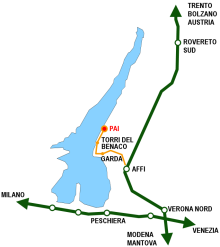 In the sixties the Villa and park were bought by the town, which subsequently turned it into a Convention Center, the first in the Garda area. In 1901 Professor Arturo Hruska, a dentist and well-known naturalist, arrived in Gardone and immediately noticed the special climate of the area. 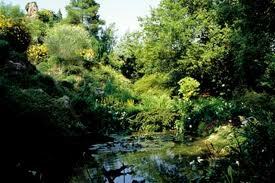 Between 1910 and 1971 he planted a botanical garden that extended for a little more than 1.5 hectares. In it he had more than 500 species of plants from every continent and different climates: magnolias, Tibetan primroses, reeds of every size, iris and ferns, including the ‘”osmunda regalis”. There is a huge variety of succulent and subtropical plants. Many aquatic plants float in small ponds with fountains and waterfalls typical of Japanese landscaping. There is also a lush forest of bamboo trees. Alpine flowers grow amidst the rocks, crevasses and small ravines. The garden, which has been owned since 1988 by the Andre Heller Foundation (the famous Austrian multimedia artist), is open from March to October, from 9:00 a.m. until 7:00 p.m. For information, please contact the Andre’ Heller Foundation – A. Hruska Botanical Garden – Via Roma – 25083 Gardone Riviera. The church, which was designed by architect Paolo Soratini from Lonate, was built over an existing building dating back to 1391. Completed in 1740, it contains two paintings — “La Pietà” and “Pentecost” — by Zenon Veronese (1448-1553), a painting by Palma il Giovane (1570-1596) portraying the Madonna, Jesus, San Michele, San Nicolò and Sant’Antonio Abate, a painting by Andrea Celesti (1637-1712) depicting San Nicolò, Sant’Antonio and San Faustino and Giovita, frescoes by Francesco Monti (1683-1768) that include the “Assumption of Mary” (1750 c.), and 14 paintings of the Stations of the Cross by Augusto Lozzia. An object of particular devotion is the “Madonna di Fraole” painting (first altar on the left), in whose honor a great festival with a procession is held at the beginning of October. The apse facing the lake is encircled by an unusual balcony that affords a fine view of the lake from San Vigilio Point to Peschiera, Sirmione, La Rocca di Manerba and the Island of Garda. The villa, on the lakefront and surrounded by a beautiful park with centuries-old trees, was once owned by Otto Vèzin, an American of German origin. Expropriated from 1915 to 1918, the villa was later bought in 1928 by Emilio and Paola Botturi-Polenghi, who had it restructured and decorated with frescoes in 16th century Tuscan style. The villa was also the stage for the love story between Mussolini, then at the end of his political career, and Claretta Petacci, who stayed in the “Red Room” on the second floor in the autumn of 1943.